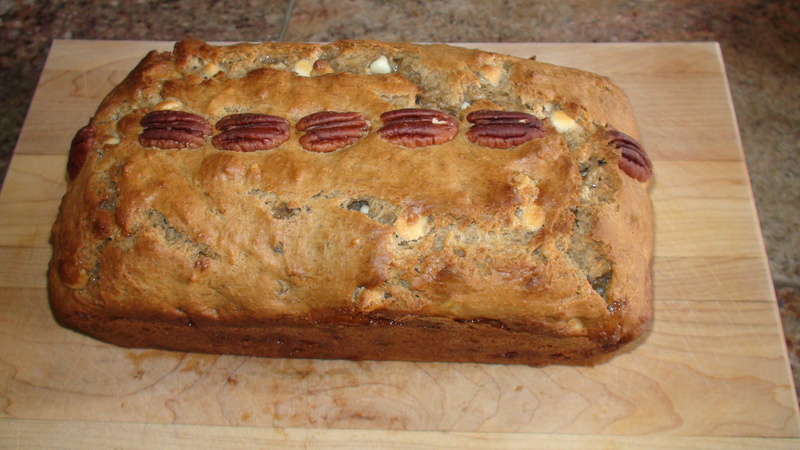 My favorite banana bread recipe is from William-Sonoma’s Essentials of Baking cookbook. If you can find the book, which is no longer available through their site, I recommend you snag it. It’s a culinary gem. I’ve since slightly altered the way I make the banana bread recipe, mainly adding white chocolate, more nuts, and cutting or tweaking an ingredient or two. I make it often, and promised a friend I’d share the wealth in time for the holiday season. Preheat the oven to 350 degrees F and make sure rack is centered in the middle of the oven. Butter* and flour either a 9×5 loaf pan, or a large muffin (makes 6) pan. Combine the dry ingredients and mix together well. In a separate bowl mash the bananas until smooth. In another bowl (or mixer) mix together the brown sugar, eggs, milk, and butter until well blended. Mix in the dry ingredients “in 3 batches alternately with the bananas.” Add the chopped nuts and the white chocolate chips and stir in. Pour the batter into the loaf or muffin pan. Add nuts on top (chopped, whole, decorative or random). In my oven I bake it about 50 minutes. The original recipe calls for 55-60 or until a toothpick comes out clean. In the muffin pan the baking time is cut to about 35-38 min. ALWAYS best served warm (it might fall apart if you don’t let it cool completely, but who cares when you’re gonna chew it to pieces anyway), with coffee, and a house full of friends. Enjoy! When I finish a stick of butter, I save the butter wrappers in a Ziploc sandwich bag specifically for the purpose of buttering a pan when baking. Take the wrapper out and let it sit at room temperature. The butter residue melts fast and you can rub it all over the pan fairly quickly, easily reaching corners and sides without the hassle you get from using the actual stick. I welcome you to join CookingUpaStorminCA.ning.com too. Sounds yummy and I might (or might not 🙂 make it but I’m totally using your idea of the butter wrappers – genius! Glad you like the butter wrappers tip, Kendra. It’s my humble contribution to the world of baking 😉, though I’m sure someone somewhere beat me to it. Oh my goodness. I am going to tweak it to make it allergy friendly. CAN NOT WAIT. Thanks for sharing!!! No nuts then, CJoy? It should still taste good. The white chocolate sets it off 😊. Have fun making & eating it! It tastes like sunshine with a side of sparkles.